Completion of Leg 13, sailing from Halifax, Nova Scotia into Gosport, Hampshire saw the conclusion of the round-the-world joint service Exercise Transglobe expedition in mid-August 2016. 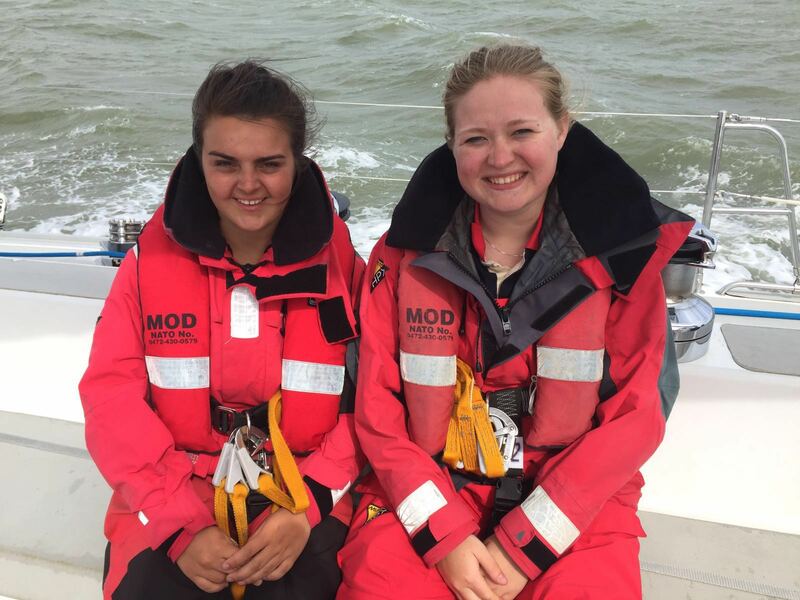 With the voyage having set out from the south coast of England in June 2015 it was with a great deal of pride and enthusiasm that air cadets CWO Jessica Doherty and CWO Emily Simister were part of the crew who had brought the 72’ challenge yacht, Adventure of Hornet, home across a stormy and challenging Atlantic Ocean. 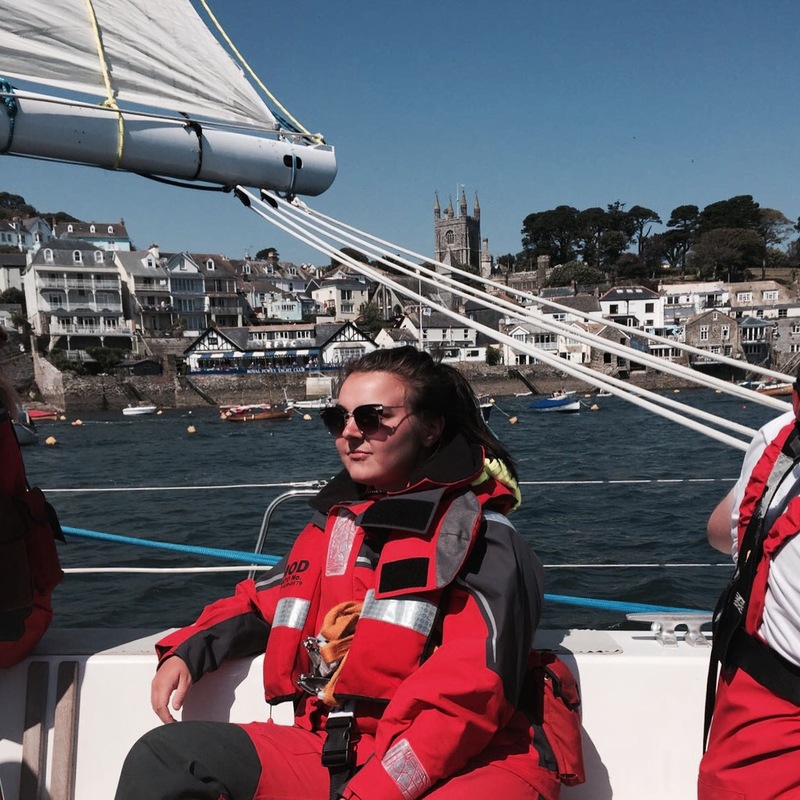 Emily and Jessica were two of the four cadets selected to join regular and reserve service personnel for Transglobe in 2016 with CWO Daniel Gardner taking part in Leg 10 from St Lucia to Miami and CWO Matthew Taylor sailing from New York to Halifax on Leg 12. To say that this was a very special opportunity for these young people, representing an organisation of around 40,000 fellow cadets, would be an understatement. However their successful involvement is testament not only to their individual skills and personalities, but also to the underpinning experiences and opportunities that they have enjoyed during their time with the Air Cadet Organisation and the support and commitment they have received from their adult volunteer staff. Of course without the invitation to take part and the agreement of the Transglobe team the opportunity would not have existed at all. Therefore grateful appreciation and sincere thanks are extended to the Transglobe team, the skippers and fellow crew for welcoming and accepting our cadets into such a privileged environment. Thanks are also due to the Ulysses Trust and the RAF Charitable Trust for their generous support and their commitment to ensuring that opportunities such as this continue to be accessible to members of our organisation. It’s always difficult to summarise the benefits of taking part in a successful adventurous overseas expedition. Some of the gains are obvious, the smiles, the anecdotes and stories, standing tall and being more confident. Others are less easy to identify, a subtle change of attitude, a career choice, and quietly encouraging and inspiring others. One thing is for sure, it’s almost impossible to tell the whole story of the young people who have travelled out across the world to join a group of strangers, sailed a 72’ yacht across challenging seas to far-flung places only seen before on a map and who, in short, have taken part in an adventure that they had only ever dreamed of. We must therefore be content simply knowing that the spirit of the Air Cadet motto, ‘Venture-Adventure’, and all that it implies, has been fulfilled. 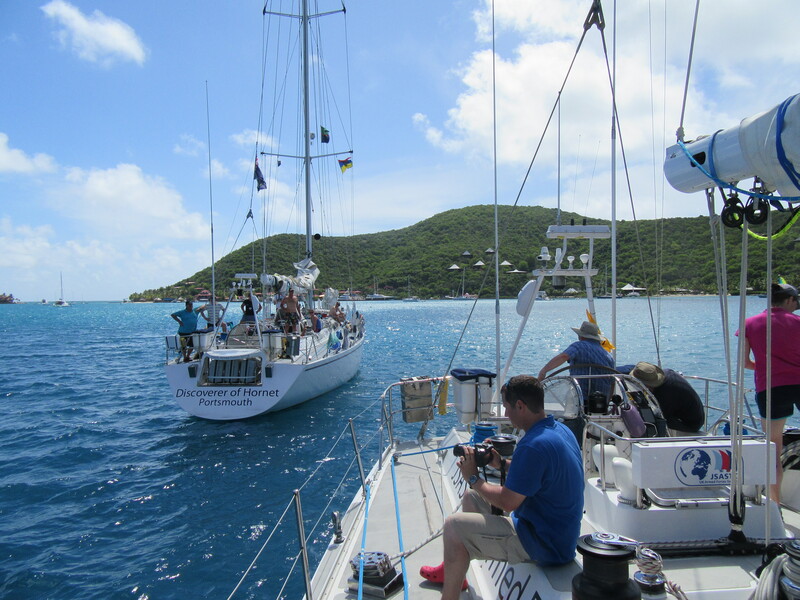 We arrived in the Caribbean paradise of St Lucia and stepped aboard our 72 foot yacht Adventure at Rodney Bay Marina… I was put in Blue watch with three other crew. The three-watch system consisted of a Mother Watch (in charge of all cooking, cleaning, etc. ), an off-watch and an on-watch. All were challenging! We started our first leg towards Antigua (roughly 200 nautical miles) and we had a good breeze, low sea-state with good visibility. We sailed through the night which meant the sky was full of stars along with shooting stars and moving satellites. This was one of the highlights for me as the sky was just spectacular. As the boat pushed through the water you could also see the phosphorescence caused by plankton on the swell – words can’t describe how beautiful and peaceful it was. During our next leg towards the British Virgin Islands living on board become more difficult due to the constant heat on deck which created an oven below! Sleep was hard… with 4-hour shifts we were lucky if we got a couple of hours sleep in-between. Duties on deck included adding a reef into a the sail or putting the head sail up or down and meant that everyone was exhausted by the time we arrived 3 days later and we happily welcomed the cold showers in the marina! Being with full-time personnel was really interesting and we had all kinds of ranks and roles on board including a PTI, an F35 test pilot, a Chinook pilot, doctors, logistics, engineering and the Reserves. I had the most amazing, fantastic time. I have learnt so much. I never thought the ATC would do anything like this until last year and it goes to show the opportunities you can get if you put your name down for it! Late evening we arrived at Liberty Landing Marina New York and spent our first night on-board ‘Adventure of Hornet’. 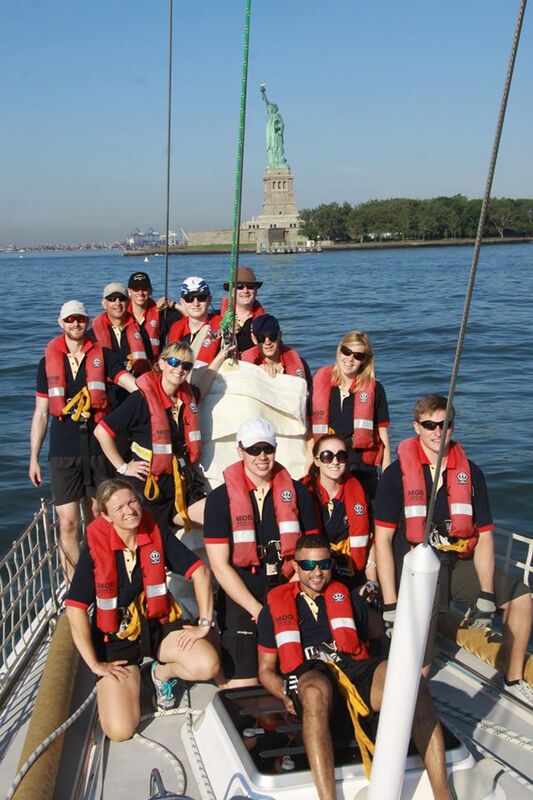 After two days learning about the boat and equipment in the mornings we set-sail… past the Statue of Liberty. Once out at sea we did our ‘Man over board’ drill and set-sail for Long Island. We stopped at Port Washington, Port Jefferson and crossed Long Island Sound to Mystic Seaport where we featured on Channel 8 news! Day 11 saw us leave Boston and head for Camden in Maine. 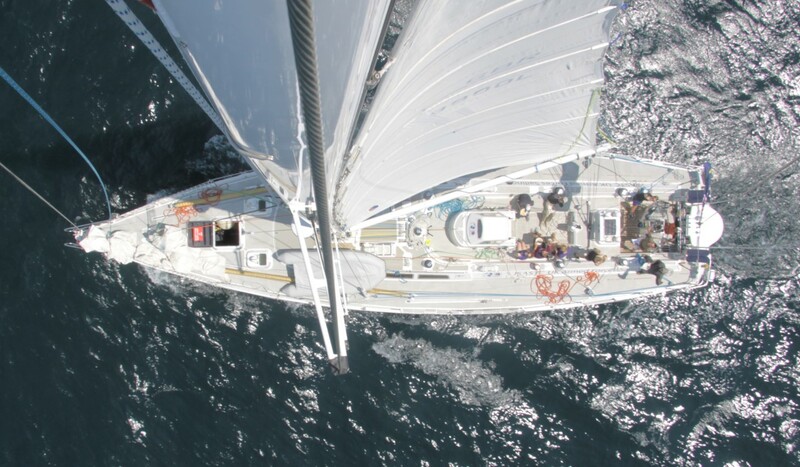 Another overnight sail and 156 nautical miles! We had a stopover in Camden before we started our pilotage through an archipelago towards Mount Desert Island, the sixth largest island in the US. We sailed from Mount Desert Island and 232 nautical miles later we arrived in Lunenburg in Canada where we anchored by the light of a full moon. The next morning we set-sail for our final stop in Halifax and arrived 5 hours later at the Royal Nova Scotia Yacht Squadron. This experience has changed my outlook on life and has inspired me to spend more time helping others. It will be one that I will never forget. The trip was one of the best things I’ve ever done in my life, the chance to travel to a new country was fantastic as well as meeting new people, some of whom I know I will stay friends with for a very long time to come. Being able to sail the Atlantic is a once-in-a-lifetime experience for most and I am so glad I am one of the few who has been able to do so. My favourite part would either be the Force 11 storm we went through… the adrenaline rush was so intense! Or it would have to be the sunrises in the morning when doing a 4am -8am shift on deck, they were the most magical times for me. I thank everyone repeatedly for contributing to the trip and being able to put up with me so well but also I urge anyone who hasn’t sailed before to just try it. Bon voyage! After a farewell from the Nova Scotia yacht squadron our trip was under way. Then there was the storm! Blue watch was happily chilling out preparing for what was going to be a lovely chilli and rice for tea when all of a sudden storm Earl hit us! And this was an ‘all hands on deck’ moment. Everyone raced to get their life jackets on and up to help adjust, take sails down and help the skipper conquer the storm. 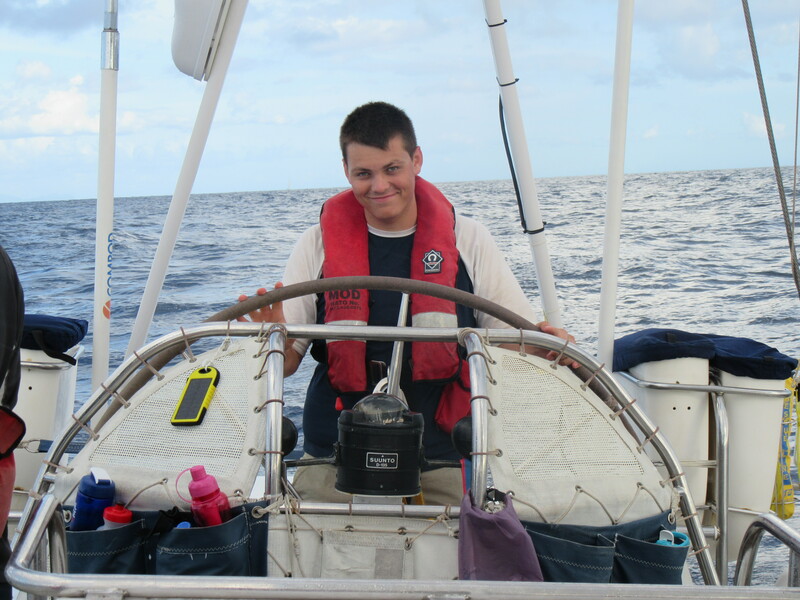 As stressful as this was it definitely made you realise what sailing is about and the trust in the crew strengthened! Safe to say we didn’t cook chilli that night! This was a once in a lifetime experience… but I definitely wish I could do it again! All I can say is a massive thank you to all who helped me get onto this trip as I wouldn’t change it for the world! Report compiled by Sqn Ldr Mike Blakey, MBE, HQAC.